When does the STEM gender gap really begin? I recently read about a study showing that the STEM gender gap is perpetuated by teacher bias. Sixth graders were given a math test, which was scored by a group of teachers who didn’t know them. When the tests were anonymous, the girls performed better than the boys. But when the teachers knew the names of the students whose tests they scored, they scored the boys higher than the girls, suggesting that the teachers had subconscious prejudices that underestimated girls’ math abilities and overestimated boys’. When the same students reached middle and high school, the girls who had received lower scores from their teachers in sixth grade (but had actually outperformed the boys, objectively) had lower math performance than their male classmates, and were less likely to choose to take advanced science and math courses. I happened to be at a playdate with my daughter when I read that article. (On the rare occasions that I go to neighborhood playdates with other stay-at-home moms anymore, I usually read science articles on my phone instead of trying to talk to them. It makes the time pass more tolerably.) 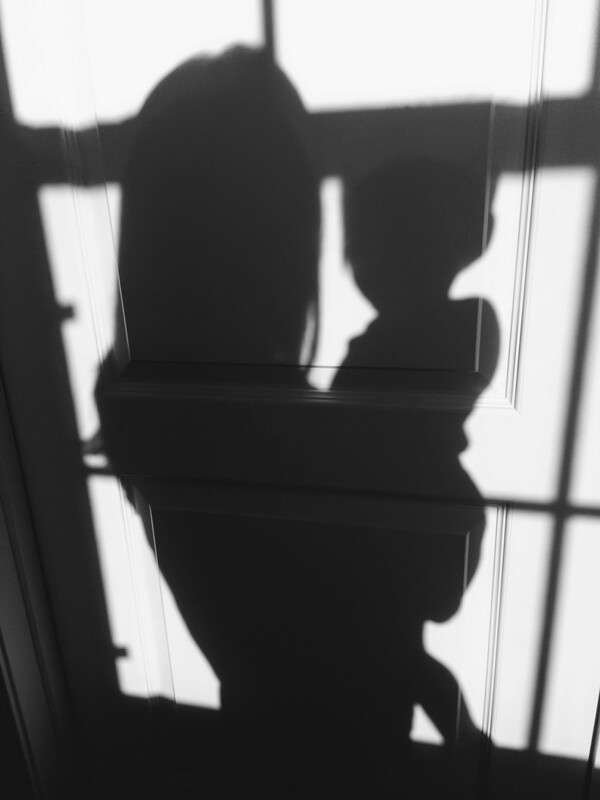 Several moms in the playgroup are pregnant with their second or third child, so this time there was a lot of talk about baby names and the sexes of the babies. In the midst of this, I could not believe all the gender stereotypes I was hearing. This blows my mind, but the sad fact is that almost every single conversation I hear among stay-at-home moms is full of similar stereotypes. With as much talk about how different aspects of the school environment create a gender gap in STEM fields, I have to believe that the gender gap begins with parents. After all, we have much more influence over our kids than teachers do, and parental influence begins from birth. If a teacher’s subconscious gender bias can affect the academic performance and interests of students over the course of an academic year, parents who stereotype their kids from toddlerhood, infancy, and even before birth surely have a huge impact on what subjects their children will prefer in school, their academic performance, and their career choices later on. If little girls aren’t encouraged to play with toy helicopters and robots and toolkits, how will they develop the desire to become pilots or engineers and the desire to learn about STEM? If parents dress their daughters in clothes that are meant to be pretty rather than functional, how will they be able to climb, dig, act like dinosaurs, or practice blasting off into outer space? (I cringe every time I see a toddler girl wearing shoes that don’t allow her to run safely; little boys are never physically restricted by their clothing.) And if the above are labeled as “boy” behaviors and interests from before age 2, is it any wonder that by the time they reach high school, girls have little interest and declining ability in math and science? The thing is, I know most of these moms would call themselves feminists and say that they want their daughters to have all the same opportunities as their sons, and some may even wish for their daughters to go into STEM fields. But a few words of encouragement when a girl is already in school are not going to be enough to counteract years of subconscious messages from funneling her towards certain toys, books, and hobbies and away from others. Of course, staying away from gender stereotypes has many other benefits for kids that have nothing to do with their interest in STEM. But I think it’s obvious that if you want boys and girls to have the same opportunities in STEM fields later in life, you have to give them the same opportunities from the very beginning of life. If you look at one of the four type dimensions at a time, you can see some clear patterns. J’s rank ahead of P’s in income across the board; they are more ambitious, driven and action-oriented than P’s, who are observers more than initiators. E’s generally pull ahead of I’s, which makes sense given that social acumen matters a lot when it comes to job interviews, business deals or salary negotiations. T’s tend to have higher income than F’s. 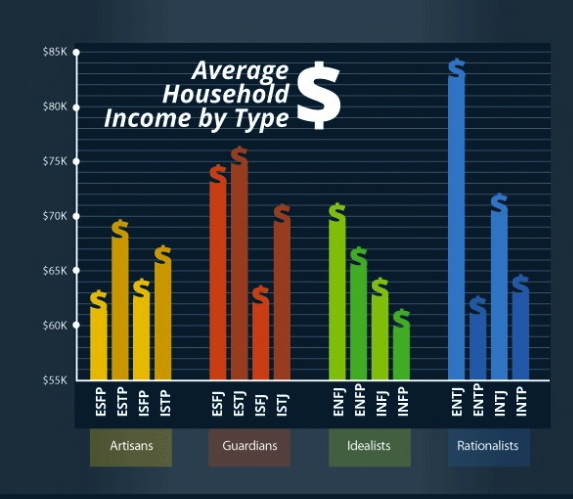 ENTJ’s pull far ahead of all other types in income, leaving the other NT Rationals in the dust. Like all NTs, ENTJ’s are brilliant, analytical, behind the scenes thinkers, but unlike P’s they are driven and goal-oriented, and unlike INT’s they have the social skills and initiative to take advantage of every opportunity. Of course, income is highly dependent on the kinds of career fields that each type is inclined to choose. F’s are probably more likely to go into lower-paying fields because they prioritize the emotional dimensions of a career over how much they pay, and are probably more likely to go into non-profit fields. P’s are also more likely to choose lower-paying careers because they value the process of a task more than the endpoint, and are less likely than J’s to see work as a means to an end. P’s value the gaining of information, experiences, and perspectives, and may want to maximize personal growth and fulfillment rather than income. As a group, SJ’s have the highest income, and they are probably the group least likely to prioritize intrinsic value over income.